The MCR Safety GP1050NT Cotton Jersey Nitrile-Coated Work Gloves are constructed from a heavyweight liner with an extended cuff and full nitrile coating for enhanced protection against abrasion. 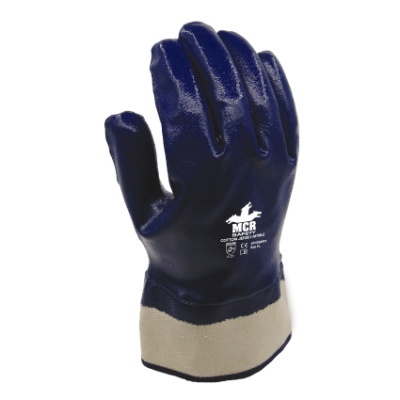 Providing good grip and suitable for use in dry and oily environments, these gloves have a wide range of uses, from gardening and landscaping, to construction and maintenance. The GP1050NT Cotton Jersey Work Gloves are available in sizes 8 - 10, one of which should suit the hands of most users. Please measure the circumference of your hand around the knuckles (excluding the thumb) with your hand open and your fingers together, and the length of your hand from the tip of your middle finger to your wrist.